This week I was made aware of a great new website that I think not only has broad interest and appeal, but also a high level of cool. Historypin is a collaborative website where google maps and google street view is combined with user contributed photographs in order to provide the viewer with a doorway to the past. Users on the website can scan and upload their own photographs and place them onto a google map so that any visitor to Historypin can access the photograph in order to get a peek into a particular area during a certain time period. The website works by simply browsing on the map or by searching for specific places, time periods or events. In addition to their photographs, contributors can also add stories about the image, helping to give the photographs further context and meaning. Users can also expand on the content by contributing comments, or by adding on to a particular photo’s story. This is a cool tool that would of interest not only to historians and genealogists, but to anyone curious about their surroundings. After checking out Historypin I did some research and came to realize that the ideas and technology behind Historypin have been used in a number of other formats and websites that are again, cool and worth checking out. A Flickr group entitled Looking into the Past may have been the catalyst for many of these ideas. The open group has over 3400 members that have created images within images, often by simply holding up an old photograph against its current location. The website has images from around the world and a discussion board posting announcements regarding this particular style of photography. 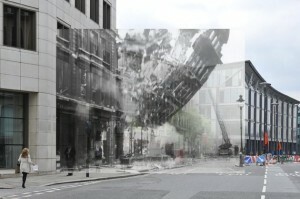 Also worth checking out is Museum of London: Streetmuseum. Launched this past spring, this free iphone application was created by the Museum of London in London, England as a way to let Londoners, tourists and curious iphone users to interact with the history of that great city. The application combines both the fine art and photograph collection of the Museum of London with the technology of Google maps so that any user can walk the streets of London while the past come alive on an iphone screen. The application is perfect for tourists who want to have their own personal walking tour, or I imagine a nice way to pass the time while waiting for a late friend on a London street corner. Rather than fuming about their bad manners, why not investigate how that particular corner looked back in the 1800s. Finally, it is definitely worth checking out the work of Russian photographer Sergey Larenkov. By using Photoshop to literally fuse together the present with the past, Larenkov has created a haunting series of photographs that document the siege of Leningrad and other events of the Second World War. 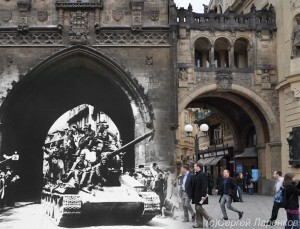 Beginning with the sites in the original wartime photo taken across Eastern Europe, Larenkov returned to the locations and shot the places at the exact same angle in order to superimpose the original and new photos together. The results are ghostly and moving. Editors note: For another blog post on website connecting historical photos with maps see Space and Historical Imagery.